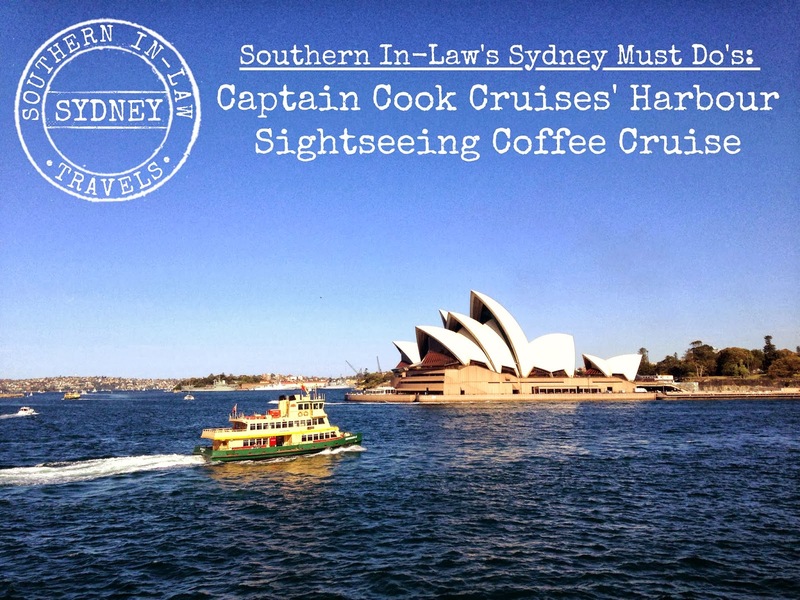 Southern In Law: Cruising around Sydney Harbour - the Captain Cook Cruises Coffee Cruise! 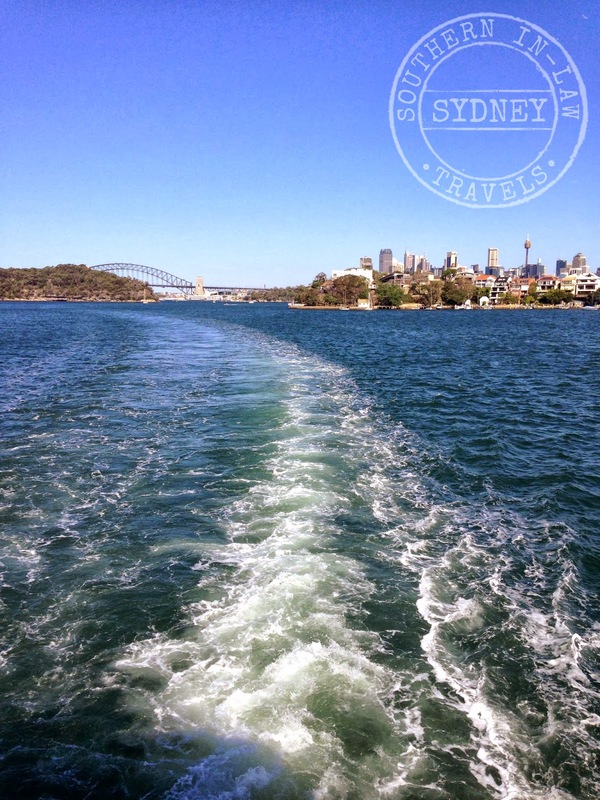 Cruising around Sydney Harbour - the Captain Cook Cruises Coffee Cruise! 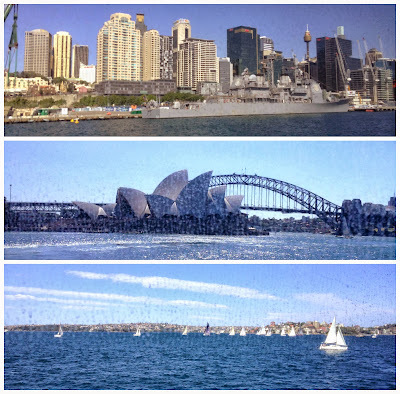 note: This is the view from the boat looking at a Sydney Ferry - not the coffee cruise boat! 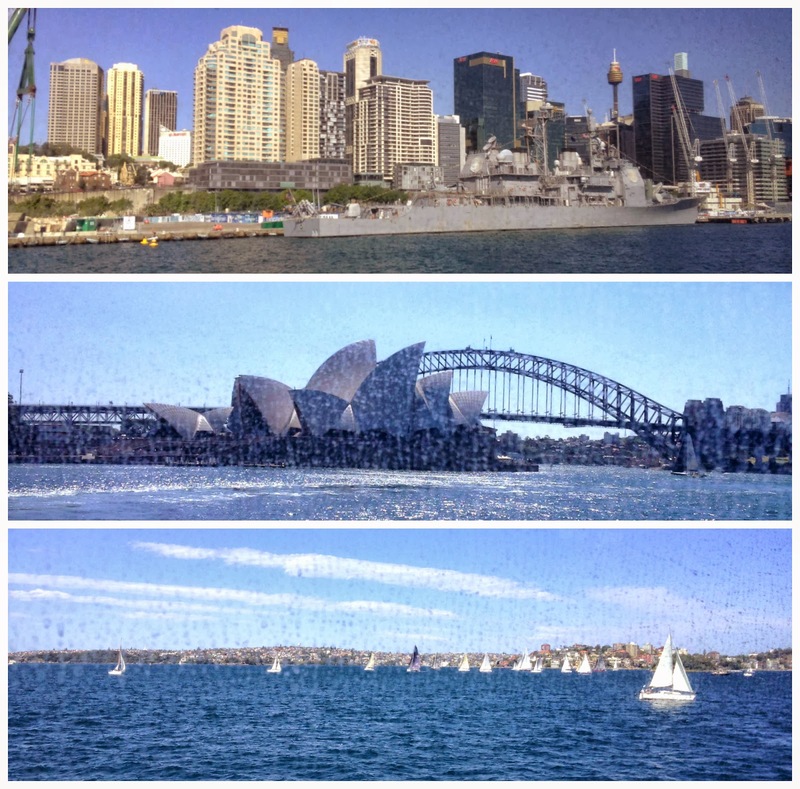 If you asked me what the best things about living in Sydney were - I think I'd have to go with how diverse it is. We're able to enjoy the beach, the city, rich cultural areas, the suburbs, national parks, the harbour, the ocean - and with just a couple of hours drive, you find yourself in the Blue Mountains or in the Nation's Capital - drive a little further and you'll find yourself in the snow fields. The Harbour is definitely the focal point of our city - and everything really does look better when you're out on the water. This is why, when Wesley was here, we decided to head out on one of Captain Cook Cruises' Afternoon Coffee Cruises. Our boat arrived at 2:30pm and everyone hopped aboard. 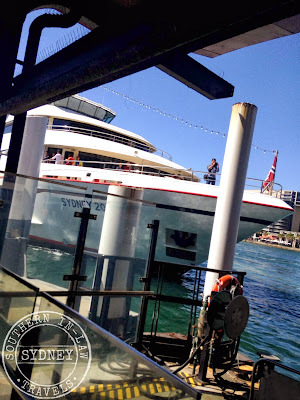 Our cruise was a little different as another Captain Cook Cruises boat was having issues and they combined a different scenic cruise with our one - but the crew handled it brilliantly and you couldn't even tell! It was really hot that day so despite my efforts to get the boys to head out on the deck in the open - they felt the air conditioning inside and I had no bargaining power from then on. Sitting inside was lovely - but there was one problem. Dirty windows don't make for good photos - and that was probably the only bad thing about the entire cruise experience. But when you're dealing with open water - dirty windows are bound to happen. We left Circular Quay and headed out into the harbour, passing the yachts sailing about, looking back at an incredible view of the Harbour Bridge (which Jesse and Wesley climbed!) and the Opera House and then heading around towards Point Piper, past Rose Bay and then looping back through. 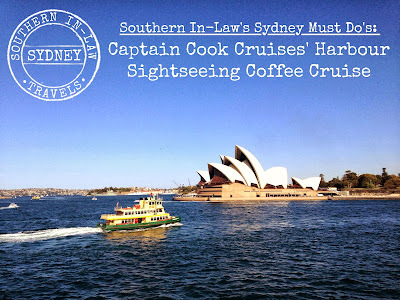 The Coffee Cruise includes morning or afternoon tea (depending on which time you choose) which for this cruise included; a lamington, mini muffin, tim tams and some butter cookies. There weren't any gluten free options or healthier options but c'est la vie! 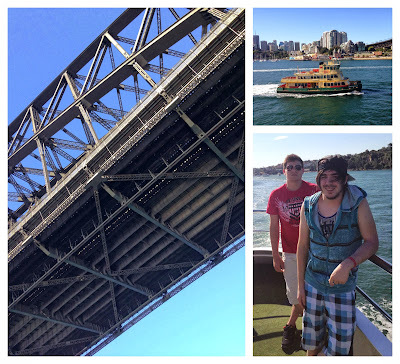 We made a stop at Darling Harbour as the other cruise needed to hop off there - but that's when I took the opportunity to drag the boys up to the top for a better view! Now, if you decide to go on the coffee cruise - or any other harbour cruise - do yourself a favour and head up to the outside decks - the view is so much better!! Cost? Currently $39 per person, including afternoon tea (usually $55 per person - offer ends November 30). Child fares are also available for $10 per child. What do you see? 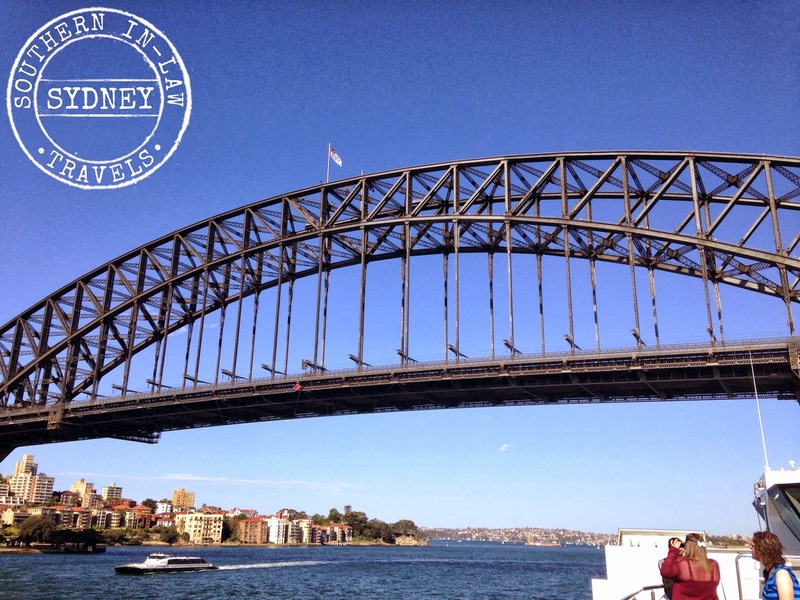 This cruise is the best for sightseeing as you get to see all of our harbours main sights - from the Bridge and Opera House to a sneaky peek at Russell Crowe's Aussie Home, past the mansions at Point Piper and so much more. 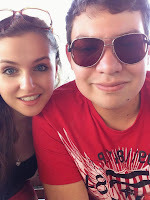 Our tips? 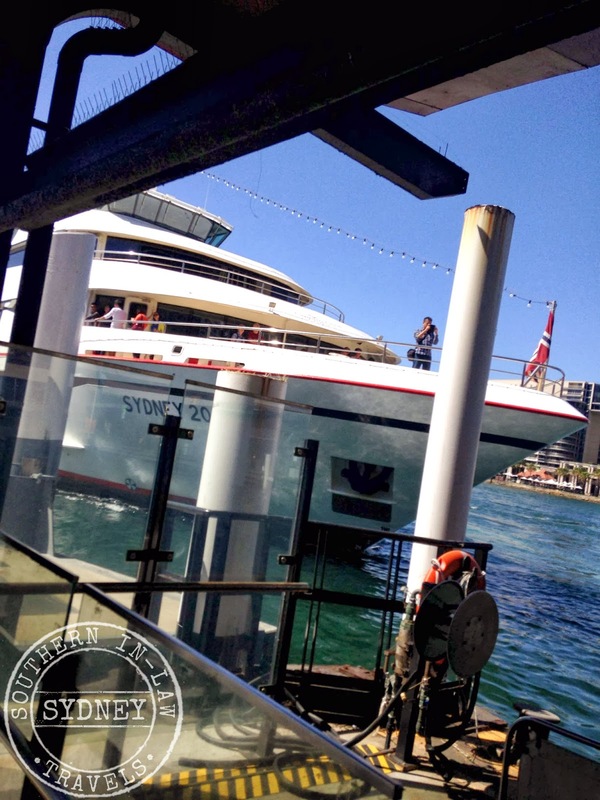 Head up to the outside decks for the best views - if you head up to the very top, you'll also get a nice breeze which is perfect for hot days! How do you book? Online! Just head to the Captain Cook Cruises Website and select the cruise you'd like to go on - there's everything from Hop on Hop Off Cruises to Breakfast and High Teas to Lunch and Dinner Cruises. But tell me, boat, plane, car, bike or walk - what's your favourite way to get around? For me, it has to be walking - but now I'm inclined to say boat too! And - if you had all the money in the world, where would you choose to live? Kristy, Jesse and Wesley were invited by Captain Cook Cruises to test out this cruise - however, as always, all opinions are entirely their own and have not been influenced by the company in any way.